3.7 out of 5 based on 129 bloggers and 34 commenters. 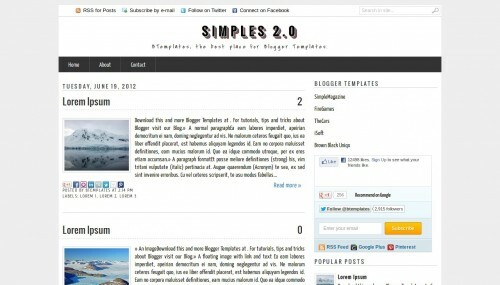 Simples 2.0 is a free blogger template with 2 columns, right sidebar, an exclusive design for Blogger, social bookmarking icons, posts thumbnails, well designed threaded comments, 3D effect and neutral colors. This is exactly what I have been looking for! I don’t know how many different templates I have gone through but this is the one that does the trick for me. Many of my readers are not very computer savvy and therefore it needs to be clean and clear enough for them to use while still looking like it is from this century. Your FAQ was great and the template was very easy to install and I had absolutely no problems with it. 5 out of 5 for me! Hello! I’m not sure how to create the links for the social buttons… Could you give me a clue please? Thanks a lot! 4/5 to this template! I like it! Hello, I use this template on my blog, but I want to make the links of the comments are dofollow. I have difficulty with this and ask for your help. I tried the standard way, which is described in many places online, but does not work. Can you give me advice? It looks great with Mozilla and Chrome, but with IE I can`t see posts thumbnails, you know why? Very nice template i am using this template to andhrawrold.in i have a doubt how to remove that comment number i want to remove that can you please tell me how to delete that? AI GOSTEI MUITO DESE TEMPLANTE…..
@Ray L: Nevermind, I figured it out :). LOVE this template! Nice themes. Lots of thanks! I too am having trouble finding how to edit the social networking buttons at the top of the page. Any help would be appreciated. I cant remove the navbar on this template. Can someone help me please? can somebody help me..if i open every post,at the comment there will be an advertisment.how to delete that thing.? but i got the problem, how to remove “0” at any post?? There is a problem in the search box, when im searching in search box its going to ‘homepage’, i cant search wot i want. plz help me how to correct it. @rahul: Can u teach me how to remove ‘0’ at any post entry? Nice template. Lots of thanks and happy new year! @kay: @kay: Did you manage to remove ‘0’ at the end of each post title ? I would also like to remove them. Thx. I want to use it on my website but in demo i am not getting how it will look with 2 coloum..
hello, I’m using this theme on my blog, and I was just wondering if there’s any way to remove the ‘read more’ feature for posts on the homepage, so that it shows all the posts in their entirety? (I know its a bit silly because this template is really good for that, but I changed my mind and can’t be bothered to faff about with customizing again). Thankyou! Can you convert this template into WordPress Theme?